The Spicer Hearing was conducted by Wells Spicer, whose time in Tombstone is best remembered for this event. During the Spicer Hearing, a great deal of debate and publicity was generated. A series of issues that had plagued Tombstone and its environs were brought into this discussion that would shape the views of many at the time this was news. It can be argued that this may still be part of the perception of these events even today, over 130 years after it all occurred. It was during this time the beginning of a movement to conflate the activities of the McLaury brothers with the much hated stage robbers was also underway. It was a conscious decision made in the Epitaph’s article to point out the involvement of the Earp brothers in the pursuit and capture of stage robbers. Few could argue in favor of these “knights of the road,’ the murders they committed, and the financial losses that they caused. At the same time though, the McLaury brothers were not among the group that murdered Bud Philpot during a botched robbery attempt that shocked the area and was mentioned during the Spicer Hearing. 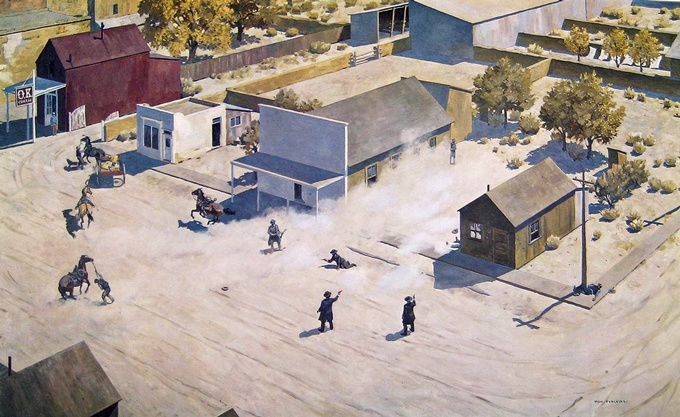 An artistic rendering of the Gunfight near the O.K. Corral, formerly from the collections of John D. Gilchriese, who amassed the largest private collection of Tombstone artifacts and the Earps ever assembled. Gilchriese commissioned artist Don Perceval to create the image in 1966. Perceval took his work so seriously that he traveled to Tombstone during the project on October 26th to accurately observe the shadow angle of the sunlight. It was true that the McLaury brothers had been accused by Lt. Hurst of involvement in the concealment of the stolen government mules, and Frank McLaury didn’t enhance his reputation when he accused Hurst of stealing the very mules that he was tasked with recovering. It is also true that Billy Breakenridge warned Frank McLaury that his association with the likes of Curly Bill Brocius would harm his reputation. But even that did not offer any proof or indication that Frank and Tom McLaury were part of robbing stages in the area. Although the Epitaph did not directly accuse the deceased of such crimes, the implication was clear that they were of the same ilk. Concerning a stolen horse, Breakenridge recalled telling Frank McLaury, “You are posing here as honest ranchmen. It is well known that you are harboring rustlers and outlaws and dealing in stolen cattle, and you dare not let me go back without the horse. You are under suspicion, and if I go back without the horse and tell that you would not give it up, you will have to quit ranching here and join the rest of the rustlers.’” Breakenridge went on to say that Frank McLaury assisted in retrieving the stolen horse. Billy Breakenridge, author of Helldorado. If the Earp defense wished to make the deceased brothers appear menacing, this was made easier when the McLaurys themselves took offense at the Earps’ involvement in the arrest of Stilwell and Spence. That they chose to threaten the Earps over the matter made them appear more sympathetic to the lawlessness in the area in general. This could only benefit the Earps as they hoped for a quick release from the charges against them. The reverence which the living show to the memory of those who have died would be skillfully counterbalanced as Tom Fitch and the Earps presented a view of the McLaury brothers and Billy Clanton that might improve the outcome of their case. Spicer was indeed correct that Tombstone from its earliest days had suffered from intermittent shootings and stabbings and crimes of all sorts, gaining a hard reputation locally and nationally. But this argument, perhaps intended to allay the gravity of the incident, offered no proof that the deceased had caused the “terror” to which he referred. His statement indicated that the presence of such individuals was impeding the progress of the territory. But was it convincing that the deceased could be viewed as acceptable collateral damage because they were known to associate with the undesirable element? Many in Tombstone would soon find themselves strongly opinionated on one side or the other. Those who saw the deceased as part of a wider criminal network were less likely to oppose the actions of the Earps in the matter, and the fact that the Earps had police powers at the time of the incident was key to their defense. Whether the local populace was divided into Earp supporters or their detractors, many in Tombstone saw the gunfight as an ugly event that they would rather forget ever happened. 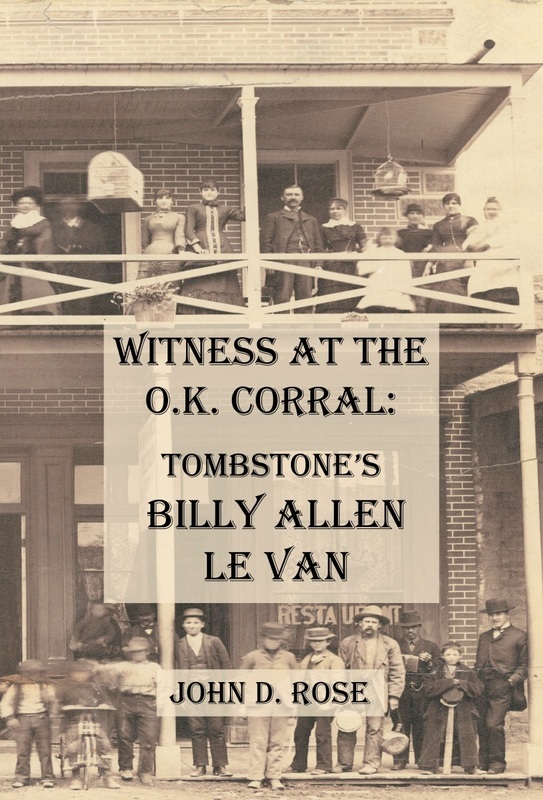 For the friends and relatives of the deceased, the matter was far from over as the Earps would soon learn. Judge Spicer’s decision in favor of the Earps and Doc Holliday at the conclusion of this hearing was some good news in their gunfight related troubles, but they would see their immediate future dominated by its aftermath, with further dangers to come.